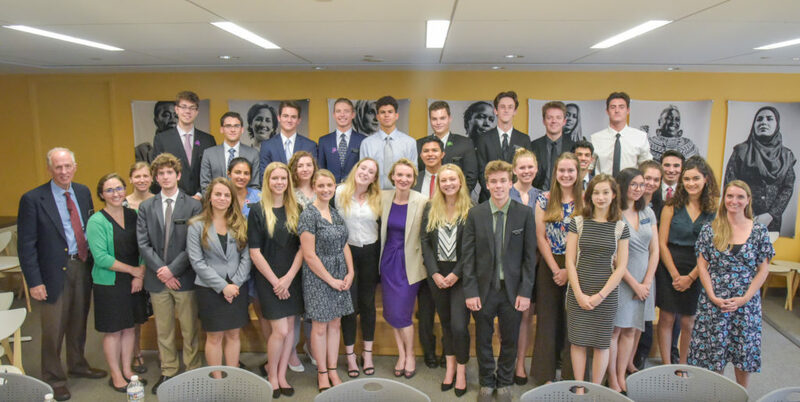 Every two years, juniors and seniors from Mount Madonna School travel to Washington, DC to meet with both political and NGO leaders. This is the blog for the 2018 journey. 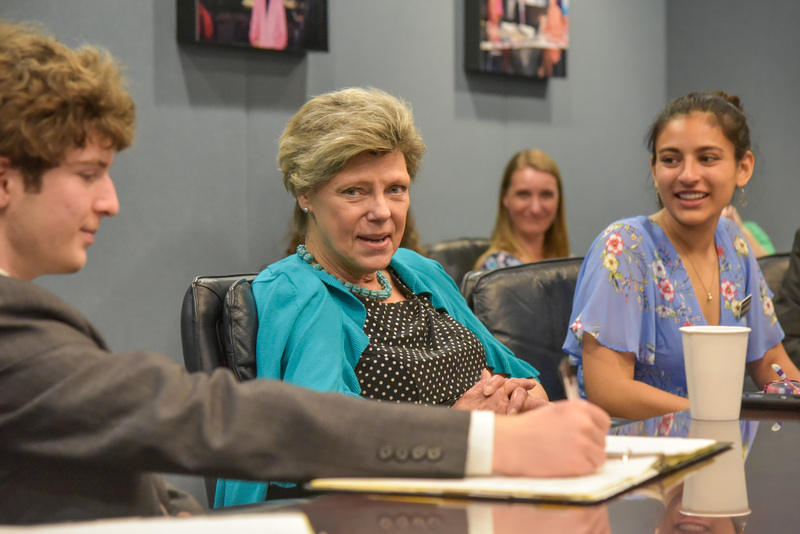 Today we had the amazing opportunity to speak with Cokie Roberts, a journalist, author, and news commentator, currently at ABC, as well as a grandmother, and extremely confident and intelligent woman. I was really excited to interview her from the second we started researching because of her extensive career. She is such a important public figure and she is in the public eye on a regular basis. This made me curious about the most difficult thing that comes with being in her position. One of the biggest things I took away from our interview was her response to this question. She said a difficult part of being a public figure is the constant judgment of everything she does: her opinions, what she looks like, and even her age. When asking the question, I related it to my interest in acting as well as my plan to make it my career, and I loved her answer. She was positive and encouraging, and said that it was a great idea. Not only that, but she stated that I could use my art to help spread my views and make a difference. This stuck out to me because I never really thought of art to be a way to spread awareness of societal problems, and I found this extremely eye-opening. The empowerment of women has been a strong theme throughout this whole trip, especially because of the current political climate. Cokie spoke about the strength of the “Founding Mothers,” which she discovered while doing research for her book. She addressed the issue that history often doesn’t account for half the population, which is really disheartening. Cokie told us about the importance of her female friendships and her relationship with her mother and how the women in her life, including the nuns of her early education, have been foundational in her success and well-being. 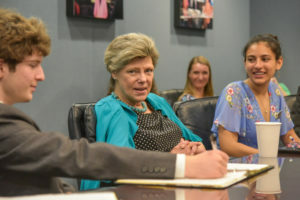 After our break from interviews in the mountains, I was ready to come back and excited to meet Cokie Roberts. Back in DC, I was nervous to conduct this interview in the ABC headquarters, but so excited to meet such an acclaimed public figure and hear what she had to say. After decades of work in journalism, Roberts is not short on experience. She has worked as a reporter and analyst for NPR and ABC, and now holds the title political commentator, meaning she can voice her thoughts about political events. One of the reasons that I was so excited for this particular interview was because of her profession. Historically, the press and media has had a negative reputation which has rapidly worsened in the recent years. Roberts was able to convey the extent of this issue, and explain that the difficult relationship between the press and the people has to be continuously addressed, as the “fourth branch of government” the press plays such a vital role in politics and government. It is a check against the other branches and is protected by the Constitution. In her work Roberts remains nonpartisan and maintains her role as a non-biased informer of the people. I also really like what Cokie Roberts said about the founding mothers which was the title of her book. She talked about how the women of that era were so politically involved, and told us stories about the humorous and sometimes ironic comments they made about what their husbands were doing. Their letters shed light on the other half of the population that history does not recognize. The wives did not see their husbands as the bronze statues that are in the halls of the capitol building, but as the real human being that suffer from the excess and frailties to which everyone is subject. Roberts had such a great sense of humor and answered our questions happily, smiling, and often with a well placed anecdote or joke. She was a clear public speaker and so interesting to hear. What struck me most was the clarity of her principles. She said that she taught her grandchildren the golden rule, and when we asked her about what the most important family values are, she simply said respect. She said that it didn’t matter what position or motivation you have (religious, humanistic, etc), but you have to respect people and try to be kind to all people. While this seems so obvious, respect for everyone is clearly lacking in the public sphere, especially between the political parties. This theme of respect is something many of our interviews have stirred, and something very important, both in D.C. and back home. 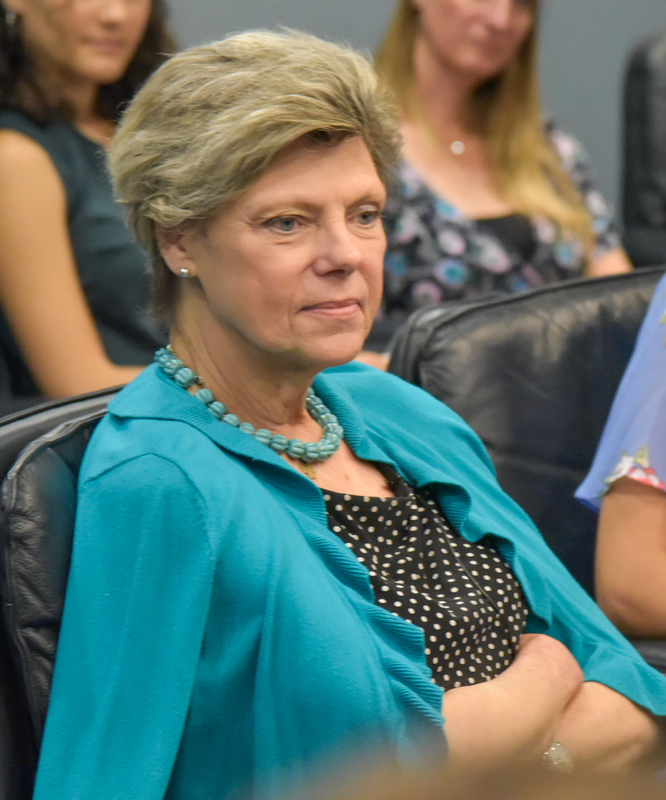 Today we interviewed journalist and author Cokie Roberts. Roberts is a very intelligent and motivated woman, who is highly articulate and kind. She is extremely sharp and has very insightful opinions and deep understanding of diverse topics. 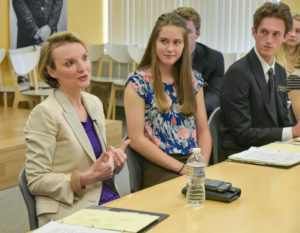 However, Roberts was particularly passionate about the new generations to come, and how young people can make a huge difference despite their age. She shared that she has five grandchildren, and watching them grow up and interact gives her hope due to the candid ways they talk and view the world. No one is born homophobic, racist, or sexist, and this truly is evident when speaking with kids. 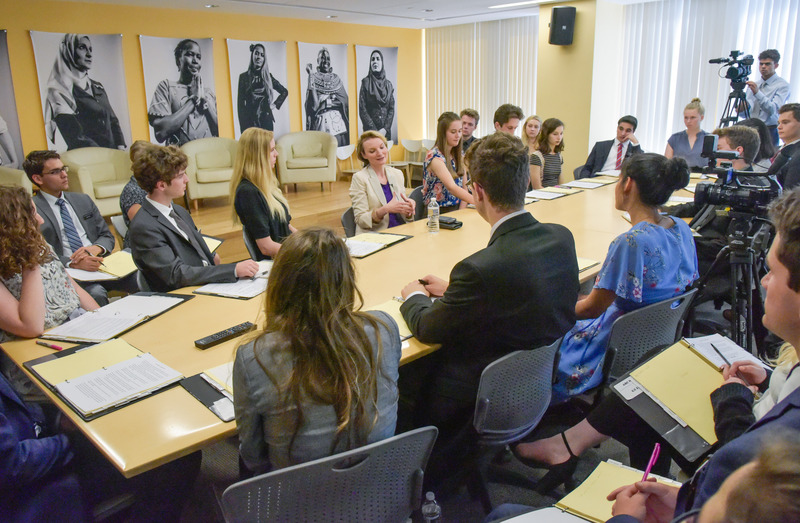 The topic of young people making change has been brought up and explored in depth by many people we’ve interviewed, which has been really inspiring. “You can’t leave out half the population.” Cokie Roberts emphasized this point when speaking on the issue of women’s rights. As several people we interviewed have stated: women’s rights are human rights. I believe all humans should be concerned about human rights because the only thing everyone on this earth shares is our humanity. Hearing Cokie talk about women’s influence in politics and how underrepresented we are has truly opened my eyes to the unequal opportunities women face, particularly in high positions. It is a very positive thing for me to interact with so many strong women in places of power, and it gives me hope there will be more like them in the future. We need more women in leadership because the more diversity there is, the more new ideas are sure to present themselves, which will ultimately benefit everyone, and hopefully people’s biases will shift toward a smarter and more inclusive world. 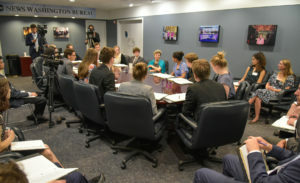 Coming into the interview with Alyse Nelson, I was expecting a solid interview with some interesting insights into life and politics, and a fair amount of parallels with the other interviews we’ve done on this trip. What we ended up with was one of the most interesting and quotable interviews of them all, and a ton of fresh ideas that gave me a newfound energy for the last couple days of this trip. I have a lot written down, so I’ll whittle it down to the things she said that impacted me the most. She’s the president and CEO (and cofounder) of Vital Voices, an organization that helps empower women worldwide and give them a platform to speak out about what they believe in. Of course, this is an extremely important and noble cause, but what I’ve found most interesting from the interviews we’ve done is the life advice we’ve gotten for the future and advice in running a business and/or managing people. One quote from her that really struck me was this: “You can’t be a leader unless you bring solutions.” It sounds obvious, but I started thinking back to all the times I’ve forced myself into some sort of position of leadership, and I realized how often I do it just so I can be a leader, not because I’m really trying to fix any specific thing. Too often I do it for myself, and not for the people I’m working with. That relates to another thing she said: “You have to support a team of people to create change.” Again, makes sense, but I don’t do that nearly enough. I’m hoping that from now on, when I find myself in a leadership position, I’ll remember this interview. A lasting idea she gave us was that we all need to find our driving force, a.k.a. the goal that you keep in mind that pushes you to work hard. Once you find your driving force, you need to stick to it in all the work you do. I thought about my driving force for this trip. It hasn’t been easy, with all the work we’ve put in, and the sleepless nights that led to long days that we’ve spent trying to stay awake, but it’s all been so we can open our minds to not just the world of politics, but to the advice of people who have led (and continue to lead) successful, meaningful lives. Like our trip to South Africa, I came to DC not knowing what I would learn from the experience, and I’m leaving with more knowledge in so many different areas and aspects of life. That’s what pushed me through all the work, and it’s been worth it. Today I was very excited because I would finally reach the interview that I was looking forward to most of all. Alyse Nelson’s energy, passion, and intelligence poured out into the room as she spoke to us. I found her to be truly inspiring because she is very passionate about her job, and she is both easy to talk to and extremely intelligent and driven. Her energy encompassed all the attributes of a powerful leader. A couple months before this trip to DC, I, along with a few other girls in my class, read Alyse Nelson’s book, Vital Voices. What truly inspired me about her book was how she was able to tie in common themes of many diverse women around the world by connecting them to the core attributes of a powerful leader. One of the main commonalities between all the women represented in her book was the immense presence of a personal driving force. Nelson heavily emphasized that a driving force, which is the “fire in the belly” found in all of us, is crucial for everyone to discover. She said that this passion can be ignited by either good or bad experiences, and then by channeling the experience into a positive power, and a sense of centered purpose is formed. 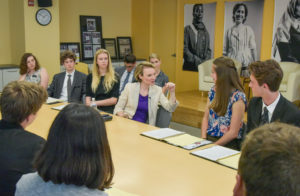 She then explained how her own driving force was “to seek the power to empower others” by acting as a “voice for the voiceless,” especially for women in countries where their rights are limited, and they are struggling to break out and excel. 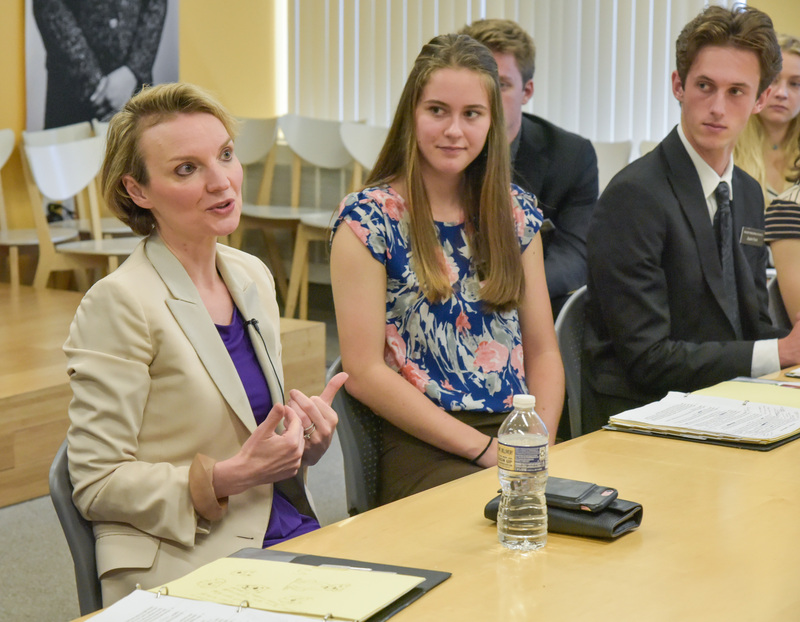 The passion and energy Nelson held in her responses to our questions truly radiated with inspiration, and showed how motivated she is by her driving force. Another impactful piece of advice that struck me was her statement, “You don’t make sacrifices; you make choices.” I found this to be interesting because it often seems as if people blame their situation or decision on a “sacrifice” they made, while in reality it was actually a choice they made. This is because, although making a decision or change often means giving up something, calling it a “sacrifice” seems to promote self-victimization, as it transforms into a setback rather than a progression. Nelson also talked about how that by giving power to the doubt you carry, you begin to doubt your power. This power of intention branches out with the attributes that should motivate us to get out of bed every day: curiosity, passion, and challenge. We heard Alyse Nelson’s name fairly frequently throughout the trip—not only because she was one of our interviewees, but because she was the reason we had landed many of our interviews in the first place. As we entered the elevator we knew this interview needed to be a good one because Alyse has made so much of this trip possible for us and classes that came before. She met us with handshakes and animated exaltations. Her passion for her job, despite having run Vital Voices for so long, was evident and sparked hope in my heart. Often, kids like me are told by our well-meaning parents that our lives will work out “as long as you are happy.” As a generally jaded teen, I worry about finding a career that I love, or that I will follow the things I love, and end up poor and miserable regardless. Alyse shared with us that she had found her passion for amplifying the voices of other women after hearing Hillary Clinton speak at a conference in Beijing when she was in her early twenties. For the past two decades, she has been working with women to challenge gender-based injustices across the world, and still manages be excited about it when talking to us. At the end of our time with Alyse, she quoted French novelist Honore de Balzac, saying, “When you doubt your power, you give power to your doubt.” Seeing Alyse speak with such unabashed enthusiasm about her work was a much-needed reminder that you can pursue your passions, find fulfillment, and make a meaningful impact on the world around you through hard work and perseverance.